John Warren, celebrity chef; Melita Vujnovic, WHO Representative to the Russian Federation; and João Breda, Head of the NCD Office, demonstrate easy and healthy recipes. To help dispel some of the new and old misconceptions surrounding healthy nutrition, WHO together with the Russian Federation Ministry of Health hosted an unconventional event in one of Moscow’s parks – a culinary master class on healthy nutrition for representatives of the media. 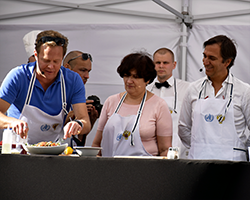 Led by famous Russian television personality and celebrity chef, John Warren, a team of WHO and Ministry of Health experts prepared a 3-course meal during the open air event on 22 August 2018. The menu included a healthy version of one of Russia’s most traditional soups, borsht, as well as a highly nutritious and filling lentil salad, and a naturally sweet and fresh dessert made with pumpkin, orange and dried apricots. Low-fat yogurt with a drizzle of lemon was used to dress the salad. The objective of the event was to demonstrate to the media that healthy nutrition can be easy, affordable and can be created following a few simple and straightforward rules. The desired outcome is that the knowledge shared during this event can help support the media in communicating informed and accurate health messages to their audience. Obesity and overweight, especially in boys aged 11–15 years, is one of the most serious health-related problems in the WHO European Region. “The issue is directly related to unhealthy diets and lack of physical activity. Food habits and food culture in Russian families, as in many other European countries are slow to change,” remarked Dr Melita Vujnovic, WHO Representative to the Russian Federation. The master class was followed by a tasting session, and all guests received educational materials: a brochure with the recipes of the cooked dishes, WHO nutrition recommendations and a portable body mass index meter. The event was attended by journalists from 14 media outlets. Limit the total amount of fat in your diet, especially of animal origin – like the one found in butter and cream. Always read the labels. If the label mentions “partially hydrogenated fat”, it means that the product contains certain amounts of trans fats. It is better to avoid it or at least reduce intake. Increase daily intake of fruits and vegetables to 400 g minimum (5 portions a day). Eat less than 5 g of salt (1 teaspoon) per day but make sure all salt is iodised. Eat less sugar. Limit daily intake to no more than 50 g (or around 12 level teaspoons) maximum for adults and 25 g for children.